Is there anything better than peanut butter for breakfast? Oh yeah, there is. Doughnuts. 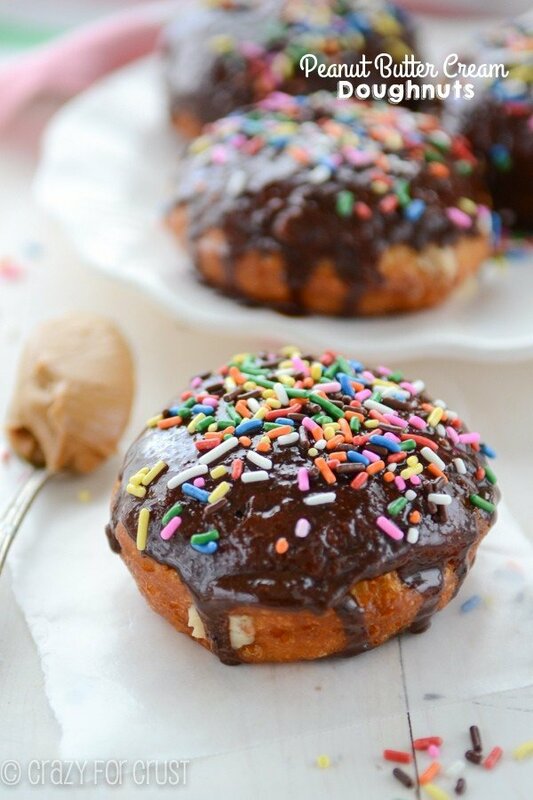 Peanut Butter Cream Doughnuts with chocolate glaze. That would be better. Bridal shower games that make the bride-to-be cry should not be allowed. And, let’s face it. Those games are kind of boring anyway. Who wants to make a toilet paper wedding dress? No thank you. Who wants to walk around with clothespins clipped to every hem totally afraid to say a word? I mean, I don’t know about you, but when I am forbidden to say something that is all that wants to come out. Who wants to cry at their bridal shower because they have to do a “how well do you know the groom” questionnaire and you get all the wrong answers because your bridal party gave your fiancé approximately 30 seconds to answer the questions so he answered them all wrong and then you fail and then you get teased all day about how wrong you are for each other? And I might be just a little bit bitter about that last one. You know what’s fun at bridal showers? Besides the family, friends, and the silky neglige you watch your BFF open in front of her grandma? I think doughnuts are the perfect addition to any bridal shower. Especially peanut butter cream filled doughnuts that are topped with sprinkles. And those would be an especially good item on the menu if the bride-to-be is in love with (1) sprinkles and (2) peanut butter. Like, maybe, my friend Sally, from Sally’s Baking Addiction. Today is her virtual bridal shower! I know that Sally would love these almost as much as we did. These doughnuts (or donuts?) blew my mind. They’re fried, which honestly, makes the doughnut, and they’re filled with peanut butter. There’s not much better than that! 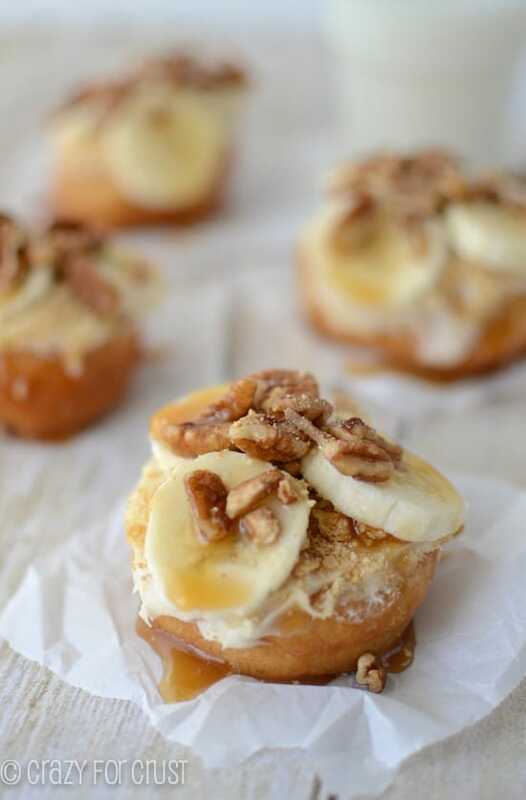 I made these doughnuts the easy way using Pillsbury Grands! Biscuits. I always have a can in my refrigerator for doughnut (or monkey bread) emergencies! These do need to be fried, but rest assured. Frying is easier than you think! 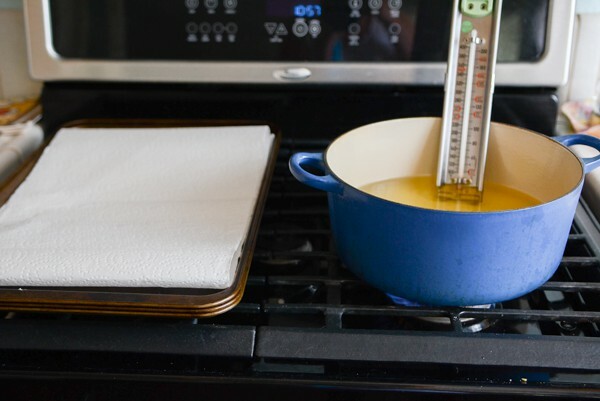 You need a heavy bottomed pot (I use a Le Creuset Soup Pot), oil, and the most important thing: a candy thermometer. Please don’t skip the thermometer, unless you’re a pro at frying. There are all sorts of tips out there for how you can tell if oil is ready, but if you’re not a pro you run the risk of (1) turning the outside of your doughnuts black or (2) hurting yourself. A thermometer is cheap and they sell them pretty much anywhere. Pick one up the next time you’re at any grocery store, drugstore, or Target. I like to use a whole 48 ounce bottle of vegetable oil when I fry. That fills my pan up about 2″ with oil. It’s probably overkill, but it works for me. Save the bottle, and once the oil cools, pour it back in to either save for future frying or for easy disposal. Once your oil is at 350°F, your’e ready to fry your doughnuts. Now, if you’ve ever fried anything, you’ll know it’s hard to keep a consistent temperature. I still have trouble with that but I find that it helps to use the heavy bottomed pot (regular thin sauce pots will let the oil heat too much too fast and can burn your food). I also constantly play with the burner temperature. I start out at medium, sometimes I’ll have to turn it up a little or down a little to help regulate. I add 2 biscuits at a time so as not to crowd my pan. Cook until they’re golden on one side, then flip and finish cooking. It takes a minute or two. Then I remove them from the oil using a slotted spoon and place them on a cookie sheet covered in paper towels to drain. Let them cool and then add the best part: the peanut butter cream filling! The filling is made with creamy peanut butter (Skippy Naturals is my favorite brand). I gave it volume by adding Greek Yogurt and some milk, and sweetened it with powdered sugar. I use a Wilton filling tip (#230) to fill the doughnuts. Usually I use ziploc bags for piping, but it’s much easier to use an actual piping bag with that tip. You can also use a squeeze bottle, if you have one. Just squeeze in the filling, made of peanut butter and butter and all things good. Then you dip them in a simple chocolate glaze made of cocoa and powdered sugar and milk. Note: the thicker the milk you use, the thicker the glaze. Nonfat milk will yield a thin glaze, regular milk thicker, and half and half or whipping cream will be an even thicker one. Use your favorite! 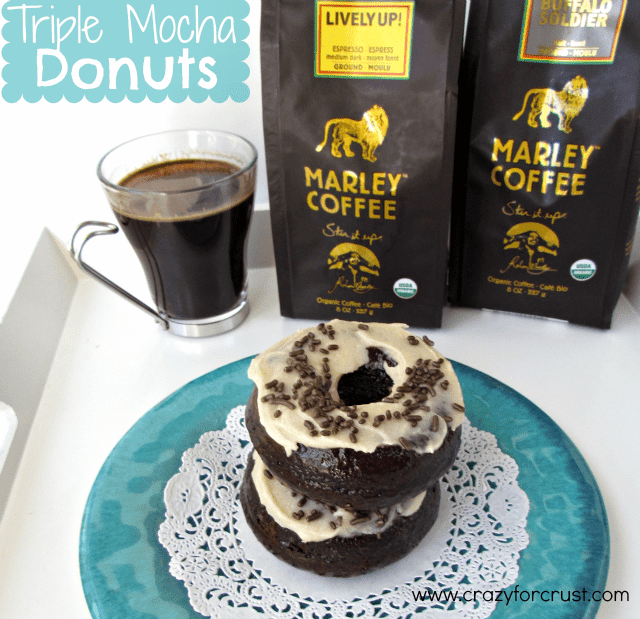 These doughnuts are chocolate + peanut butter wonderful! But don’t forget the sprinkles. Sally sure wouldn’t! Scroll down to see all the other bridal shower attendees today! 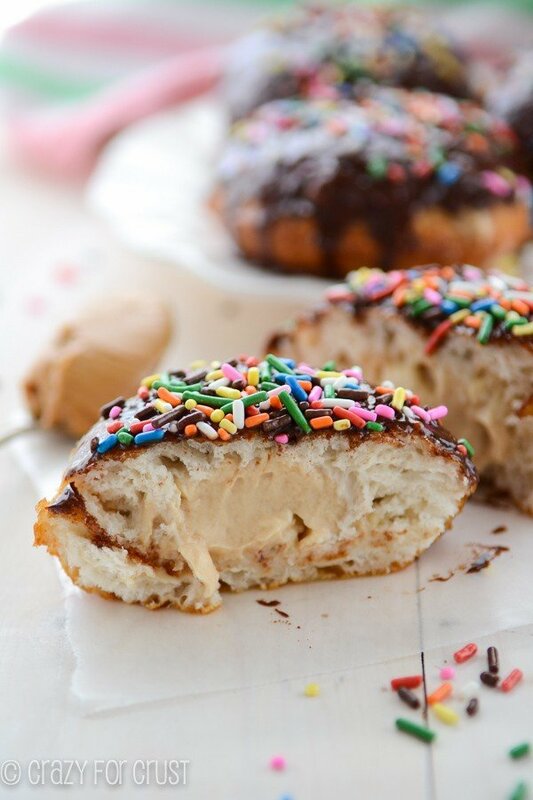 Easy fried doughnuts are filled with peanut butter cream filling and glazed with chocolate glaze. And don't forget the sprinkles! Place vegetable oil in a heavy bottom pot and heat until it reaches 350°F. I like to leave my candy thermometer in the pot during frying so I can regulate the heat up or down if it gets to hot or cold. A heavy bottomed pot is best for frying, it’s easier to regulate the heat that way than with a thinner pot. (I use a Le Cruset soup pot.) You really should use a thermometer! 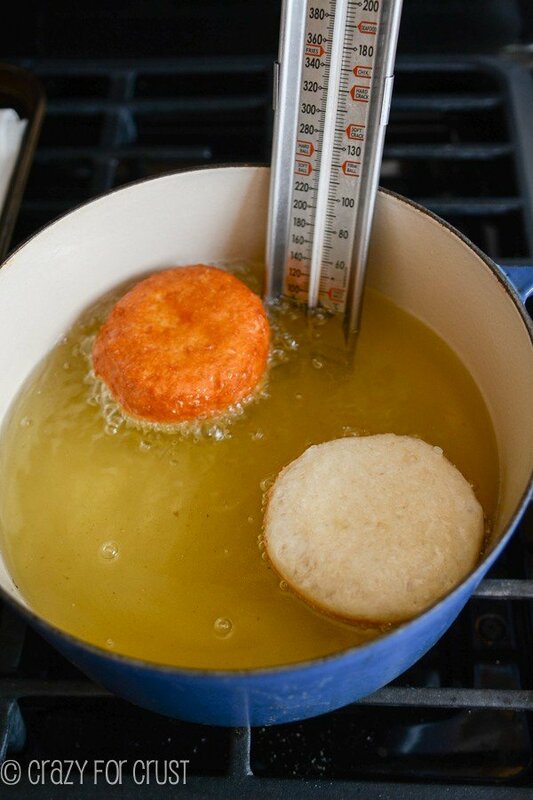 Drop 2-3 biscuits in your pot (depending on the size of your pot). Cook about 3 minutes until they are a deep golden, flipping halfway. Remove from oil using a slotted spoon and place the cooked donuts on a cookie sheet topped with two layers of paper towels. Let cool before filling and glazing. Place the filling in a pastry bag fitted with the Wilton 230 tip (or similar). (Normally I use a ziploc bag for frosting, but you really need a pastry bag for that tip. You can also use a squeeze bottle.) Press the tip into the center of each doughnut and fill. You can also turn the doughnut 90° and fill again to make sure you’re getting enough in. You’ll know you added too much when you remove the tip and it squirts out. Make the Chocolate Glaze: whisk powdered sugar, cocoa, extract, and milk in a medium bowl. If glaze is too thick to dip, you can add up to 1 tablespoon more glaze. 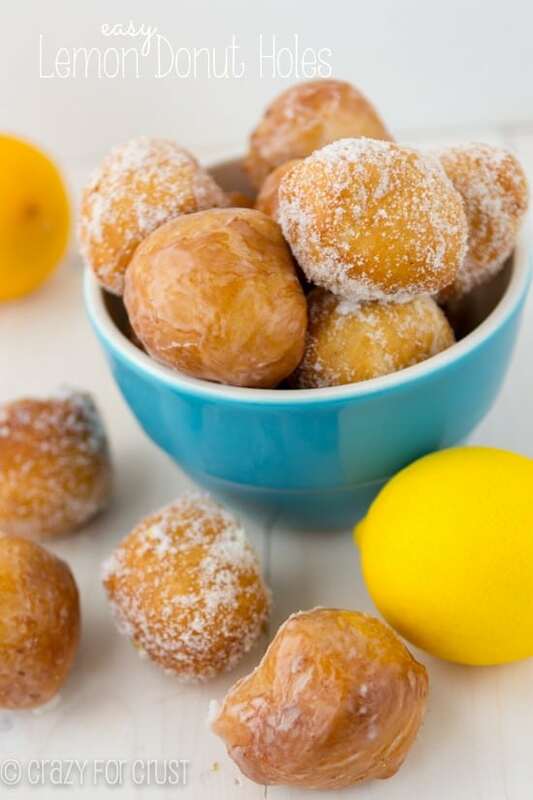 Dip tops of the doughnuts in glaze. Place on a wax paper lined cookie sheet and sprinkles with sprinkles. Let dry completely, about 30 minutes to 1 hour. Love your peanut butter cream doughnuts recipe. I’ll definitely try it, but instead of 4 tablespoons powdered sugar i’ll use honey! Thx for sharing Dorothy!